The Center began with an estate bequest in 1972 to support the operations of a reading clinic within the College of Education. The reading clinic was established in memory of Miss Belser’s sister, Dr. Danylu Belser, and Dr. Daisy Parton, both of whom were members of the College’s Elementary Education faculty. The Center ran as a reading clinic for almost two decades, initially directed by Dr. F. L. Westover. The clinic ceased serving children in 1989 during a period of restructuring in the College. New leadership in the College re-established the center in 2006 as one of the University's Research Centers and renamed it the Belser-Parton Literacy Center to recognize the broader aims of the revitalized Center. The Belser-Parton Literacy Center exists to serve local, state, and national community with the central focus on children and how their literacy needs can best be served through excellent teaching and meaningful research. The center’s areas of focus include community outreach, teacher education, and research and scholarship. The Literacy Center is a resource available to UA students, current teachers, and community partners to increase literacy and a love for reading in Tuscaloosa and surrounding counties. Feel free to visit us during our office hours below or email us at bpliteracycenter@gmail.com to schedule a visit. The Belser-Parton Literacy Center is located in the Tom Barnes Education Center on Bryce Campus of The University of Alabama. Your GPS will not find us with this address yet. 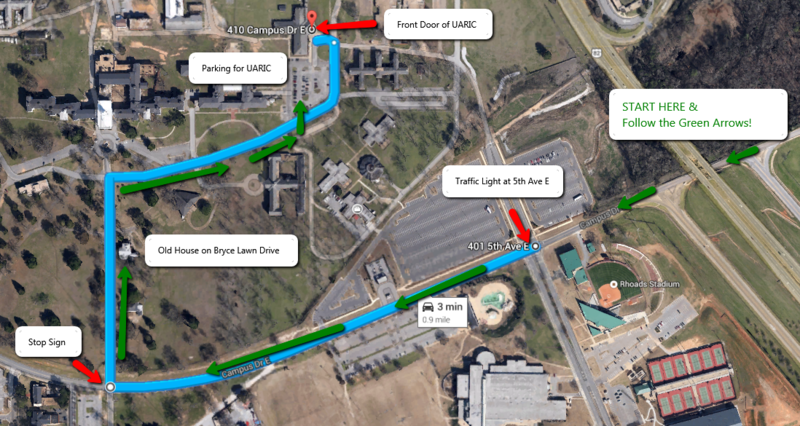 We suggest using these printable directions, the coordinates, or the map link below. For driving directions via Google Maps, click here. Below is an image of the map with annotations. Click on the image to enlarge.